Another rainy and dreary day around here today. Spent the biggest part of the day cleaning the house and baking cookies. 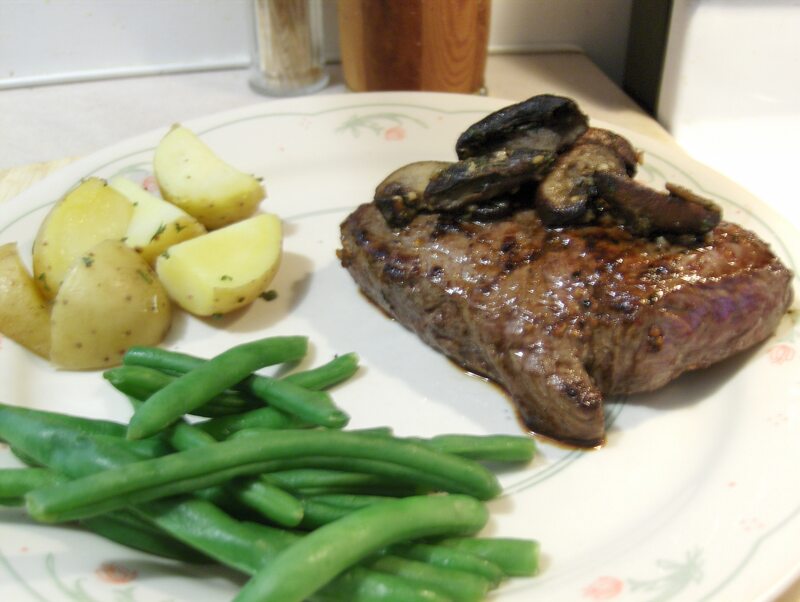 As for dinner I prepared Top Sirloin Steak & Sauteed Mushrooms w/ Baked Potato, Green Beans, and Whole Grain Bread. I used another of Costco Top Sirloin Steaks. I prefer Bison but with the cost of Bison going up I use Beef from to time, and you can’t beat Costco’s Steak for flavor! if I have to eat Beef I prefer Costco’s. I’ve yet to have a bad cut of Steak from them. As I said earlier the taste of these Steaks is heaven! The only seasoning you need for these is a little Sea Salt and Black Pepper. I pan fried it in Canola Oil about 5 minutes per side. Medium Rare and Delicious just like I like them! I topped it with Sauteed Baby Bella Mushrooms. For side dishes I had a Baked Potato that I topped with I Can’t Believe It’s Not Butter, Sea Salt and Ground Black Pepper. Along with the Potato I had a single serving can of Del Monte Cut Green Beans and Healthy Life Whole Grain Bread. For dessert later a Jello Sugar Free Dark Chocolate Pudding. I found a Top Sirloin Steak (Beef) hiding in the back of my freezer so I had my dinner. I seasoned it with McCormick Grinder Sea Salt and Black Peppercorn. I pan-fried it in Extra Virgin Olive Oil about 4 1/2 minutes per side, medium rare. I topped it with sautéed Baby Bella Mushrooms. For sides I had a Baked Potato and Pillsbury Rustic French Bread. For dessert later a bowl of Breyer’s Carb Smart Vanilla Ice Cream topped with Smuckers Sugar Free Chocolate Syrup. 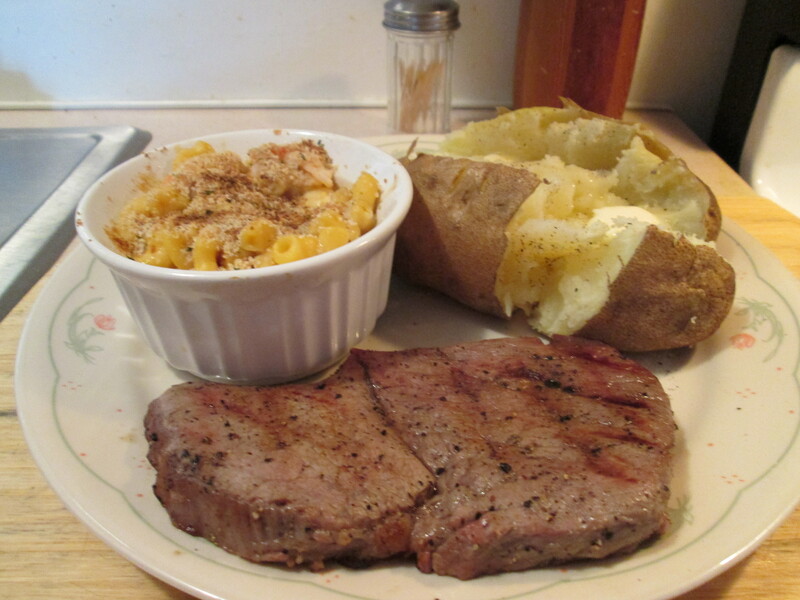 I had a Top Sirloin Steak that I seasoned with JB’s Fat Boy Premium Steak Rub. I would’ve liked to grill it but the heat index outside is 110 and the humidity is smothering so I pan fried it in Extra Virgin Olive Oil about 4 1/2 minutes a side, it was a thick cut. Turned out a beautiful medium rare and topped it with sauteed Mushrooms that I seasoned with Smoked Cumin, Sea Salt, Pepper, Parsley, and Thyme. As sides I used some leftover Boiled New Potatoes and leftover Green Beans. Dessert later Breyer’s Carb Smart Vanilla Ice Cream topped with some fresh Blueberries. I had Beef instead of Bison for dinner tonight. First time in a whille I’ve had Beef but the other day at Kroger I seen this cut of Top Sirloin and it looked too good to pass by. I seasoned the Sirloin with Sea Salt and McCormick Grinder Black Pepper. I was going to grill it but it was just too hot and humid really to be out so I pan fried it in Extra Virgin Olive Oil. It was a thick cut so I fried it about 5 minutes per side. For the Mushrooms I lightly Sauteed them in Extra Virgin Olive Oil and I Can’t Believe It’s Not Butter and seasoned them with Ground Roasted Cumin, Thyme, Minced Garlic, Sea Salt and Pepper. As sides i had a Baked Potato along with healthy Life Whole grain Bread. For dessert later on I made a pan of Pillsbury Sugarless Fudge Brownies so I’ll have a half serving of that with a couple of scoops of Breyer’s Carb Smart Vanilla ice Cream. 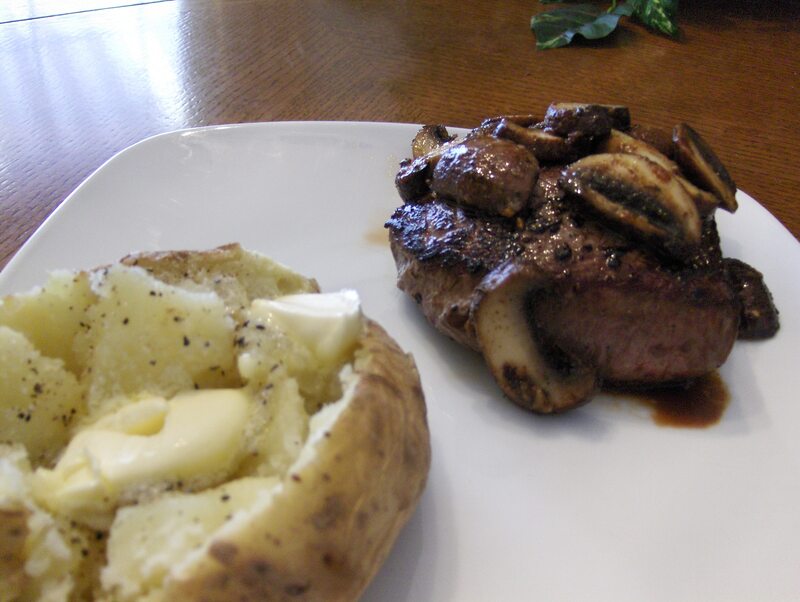 Today’s Menu: Top Sirloin Steak w/ Sauteed Mushrooms, Baked Potato, Harvest Grain Bread. Had a Top Sirloin left in the freezer, rubbed with Extra Virgin Olive Oil and seasoned with McCormick Steakhouse Grinder Seasoning. Pan fried about 5 minutes per side, Steak was thick. Sauteed some Portabella Mushrooms in Olive Oil and seasoned with Sea Salt, Pepper, Thyme, and Parsley. A Baked Potato side along with Kroger Bakery Harvest Grain Loaf Bread. Running short on time tonight, details later! 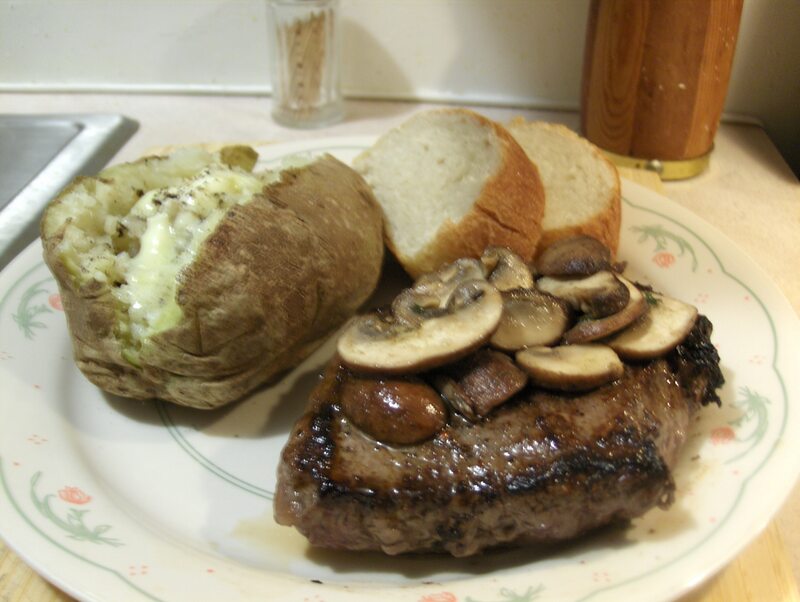 Today’s Menu: Sirloin Steak and Sauteed Mushrooms w/Baked Potato and Whole Grain French Loaf Bread. Finally back in town but pressed for time catching up. More later! Cinnamon/Chipotle Grill Mates Rub, love this Rub! Then made sauteed Mushrooms along with a Baked Potato.